North Korea’s biological weapons program got a lot less secret on June 6, 2015. 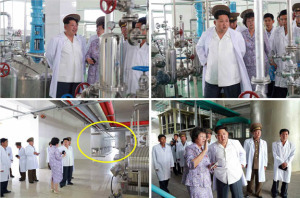 The same day that a defector reportedly fled the country carrying 15 GB of human testing data, North Korea’s state media published photos of Kim Jong Un touring a facility ostensibly for the production of pesticides. However analysis of the images reveals that the facility—the Pyongyang Bio-technical Institute—can produce regular, military-sized batches of biological weapons, specifically anthrax. The North Korean assertion that the plant is intended to produce insecticides is an old and well-used cover for a biological weapons program. In fact, it is not uncommon for biological weapons facilities to actually function as bio-insecticide plants. Iraq’s Al Hakam Factory produced both Bacillus anthracis—the causative agent of Anthrax—and Bacillus thuringiensis (Bt)—a bacteria used in Bt bio-insecticide. The Soviet Union’s Progress Scientific and Production Association in Stepnogorsk, Kazakhstan, was tasked with producing bio-fertilizers in peacetime and biological weapons for war. The same could be true for the Pyongyang facility where the scientists can convert between civilian and military strains of bacteria, by simply sterilizing and resetting the equipment in a matter of days. The modern equipment seen in the images reveal that North Korea is not only maintaining a biological weapons capability, but also has an active large-scale sanctions busting effort to illicitly procure the equipment for the Pyongyang Bio-technical Institute. This effort runs counter to international treaties, regimes and national laws that aim to prevent the spread of biological weapons, the equipment and chemicals used to make them and their means of delivery. Much of the equipment seen in the Pyongyang Bio-technical Institute violates export control laws based on the dual-use control lists of the Australia Group (AG): 41 members—including the United States and the European Union (EU)—who agreed to control lists intended to prevent the spread of equipment for use in chemical or biological weapons programs. Even countries like China, which are not members of the Australia Group, maintain national export control regulations based on the Australia Group control lists. North Korea, as a member of the Biological and Toxin Weapons Convention (BTWC), is prohibited from biological weapons development, production and use. Any activities involving the trafficking of biological weapons, their means of delivery or related materials are also prohibited by UN Security Council Resolution 1718, adopted in 2006. Based on these images alone, it is not possible to determine that the North has violated its obligations under the BTWC or UNSCR 1718. 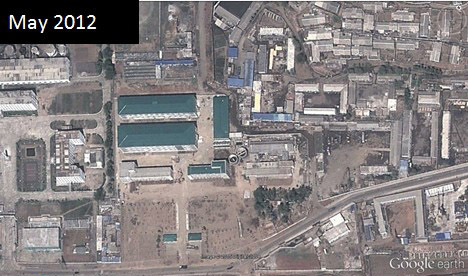 Kim Jong Un’s visit to the plant may have been intended as a veiled threat to South Korea and the United States. The visit occurred days after news broke that the American military had mistakenly shipped live-anthrax to labs in nine US states as well as to the Osan Air Base in South Korea. The shipments appeared to most of the world as an embarrassing and dangerous mistake, but were viewed by the North Koreans as a threat. By June 1, KCNA was blasting the incident as secret “preparations for germ warfare against Koreans” and denounced it as a move toward “Biochemical War.” By June 12, North Korea requested a UN Security Council investigation of the United States. This reaction reflects Pyongyang’s long-standing accusations that the US intends to use biological weapons against the North dating back to the Korean War when it accused the Americans of conducting BW experiments on Koreans. Additional open-source research reveals that the Swiss branch of an international nongovernmental organization provided training and basic equipment to the North that may have inadvertently contributed to North Korea’s ability to produce BW. 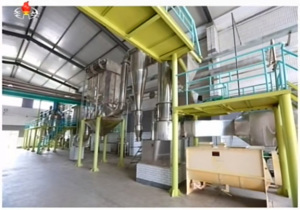 CABI, a group that runs agricultural aid programs around the world, established a pilot facility in 2005 at the Plant Protection Institute for the production of Bt bio-insecticide with funding from the Swiss Agency for Development and Cooperation and using Chinese equipment. 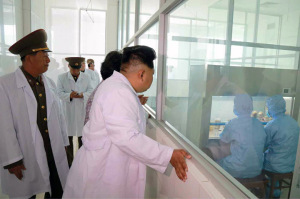 Unfortunately, this pilot facility can also be operated to produce anthrax and was possibly a training ground in preparation for the construction and operation of the large-scale facility that Kim Jong Un toured. Images and video from the CABI website show training activities and equipment at the Plant Protection Institute located approximately 15 kilometers from the site Kim Jong Un toured. 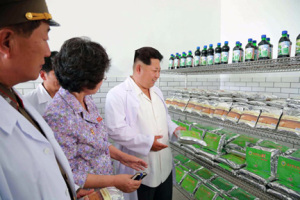 Kim Jong Un inspects packages of Bt bio-pesticide. What Is the Difference between Bt and Anthrax? Bt or Bacillus thuringiensis is a bacteria often used as a natural pesticide in organic farming that can be found at the local nursery or hardware store. The problem is that its cousin, Bacillus anthracis—the causative agent of anthrax—is produced through identical means. A facility capable of producing Bt is also capable of producing anthrax. Bacillus anthracis, on the other hand, is the bacteria that causes the disease Anthrax. Dried spores can be absorbed through cuts in the skin, inhaled or ingested. Once inside the body, they activate, multiplying and releasing toxin. Inhaled spores are the most difficult to treat because Anthrax progresses rapidly, the symptoms are hard to diagnose and specific antibiotics and antitoxins must be administered early and aggressively. If spores were dispersed over a large crowd without warning, it would be extremely difficult to diagnose and treat on a mass-scale. The most effective way to deliver spores is using a manned or unmanned aerial vehicle like a crop duster to spray the powder up-wind from the targets. To that end, North Korea may seek in the future to outfit its growing drone collection with suitable spray nozzles. How Did North Korea Develop This Dual-Use Capability? Very little is known about the origin or capacity of North Korea’s biological weapons (BW) program. While there are assertions that North Korea acquired a sample of Bacillus anthracis in Japan in 1968 and subsequently set up BW research centers, there have been varying accounts of their actual ability to weaponize and produce it on a military-scale. In fact, since the late 1990s, statements by US military and intelligence agencies have tended to characterize the DPRK’s capability as rudimentary, and have indicated that North Korea could build up a supply of biological weapons rather than asserting that it was maintaining active, weaponized BW munitions. In a speech at Osan Air Base in 2005, General Leon LaPorte, Commander of US Forces Korea, stated that he did not believe North Korea had been able to weaponize biological weapons, but that they were working on it and were continuing to experiment. The same year, an international nongovernmental organization may have inadvertently provided training and basic equipment that contributed to Pyongyang’s ability to produce BW at the Pyongyang Bio-technical Institute. CABI, a group that runs agricultural aid programs around the world, established a pilot facility at the Plant Protection Institute in 2005 for the production of Bt bio-insecticide with funding from the Swiss Agency for Development and Cooperation and Chinese equipment. Unfortunately, this pilot facility could also be operated to produce anthrax and was possibly a training ground in preparation for the large-scale facility that Kim Jong Un recently toured. Images and video from the CABI website show training activities and equipment at the Plant Protection Institute at the Academy of Agricultural Sciences in Pyongyang, located approximately 15 kilometers from the site Kim Jong Un toured. 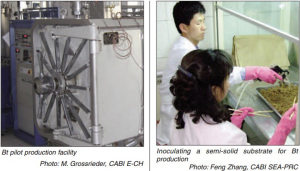 The Chinese equipment provided by CABI is lower quality and much smaller scale than viewed by Kim at the Pyongyang Bio-technical Institute but is still dual-use. Though there are only two images of the equipment (see below), both show items of a similar type and quality as found in the Iraqi BW program. If these pieces were indeed of Chinese origin and they were exported after 2002, then the autoclave and laminar flow table could have been subject to China’s “catch all” requirements, which prevent exports—even if they fall below control thresholds—if there is reason to believe they would be used in a WMD program. China, like many countries, has had difficulty successfully reaching out to companies to inform them of catch-all requirements. Images of the CABI pilot facility in DPRK. CABI ran a large-scale training program emphasizing capacity building that possibly inadvertently contributed to North Korea’s anthrax program. Its train-the-trainers program was designed specifically to spread knowledge of how to make and use Bt. Teaching how to apply Bt to crops is largely harmless, but teaching how to make Bt is essentially the same skill as teaching how to make anthrax. This kind of export is known as an intangible technology transfer (ITT). Even when there is no exchange of a physical good, an export can take place through email, printed documents or verbal training. More information about the exports is needed to determine whether this activity violated any law. CABI-DPRK co-authored article describes Bt training program. 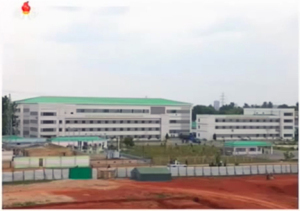 Of course, it is difficult to establish a direct link between the CABI pilot plant and the Pyongyang Bio-technical Institute that Kim Jong Un toured. CABI has worked hard to improve food security, increase internet access and help both farmers and scientists in North Korea. This case, more than anything, demonstrates the challenges facing governments as they try to prevent the spread of biological weapons. Facilities producing biological weapons like anthrax are by their nature dual-use, making them very difficult to identify and monitor. Historically, two other biological weapons programs are known to have operated as both civilian producers of bio-insecticides and biological weapons. Iraq’s Al Hakam Factory produced both Bacillus anthracis—the causative agent of Anthrax—and Bacillus thuringiensis—a bacteria used in Bt bio-insecticide. The Soviet Union’s Progress Scientific and Production Association in Stepnogorsk, Kazakhstan, was tasked with producing bio-fertilizers in peacetime and biological weapons for war. Given North Korea’s history of BW research and the inordinate amount of expense and risk taken to import the banned equipment when they could have imported the pesticide itself without restriction, it is likely Pyongyang intends to use the facility in a similar way. Images of Iraqi dual-use equipment. 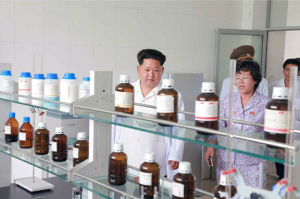 On June 6, 2015, KCNA, KCTV and Rodong Sinmun covered Kim Jong Un’s visit to the Pyongyang Bio-technical Institute run by Korean People’s Army (KPA) Unit 810, which is also in charge of fish farms and experimental farms recently visited by the North Korean leader. 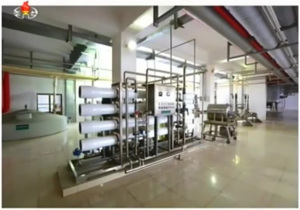 Images of this tour show facilities that are larger, with better equipment and a higher production capability than the pilot plant built in 2005. 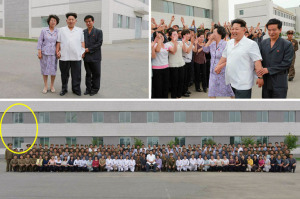 In addition to walking around the grounds and inspecting equipment, Kim also posed for a group shot with scientists and staff, as well as KPA Unit 810 officers. KCNA only identifies three individuals other than Kim Jong Un: Hwang Pyong So, Ri Jae Il and Jo Yong Won. They are seen touring the facility and in the group photo. The plant managers, scientists and staff are not identified in media. Reflections in the windows of the front building show a transmission tower, which is confirmed in satellite imagery. 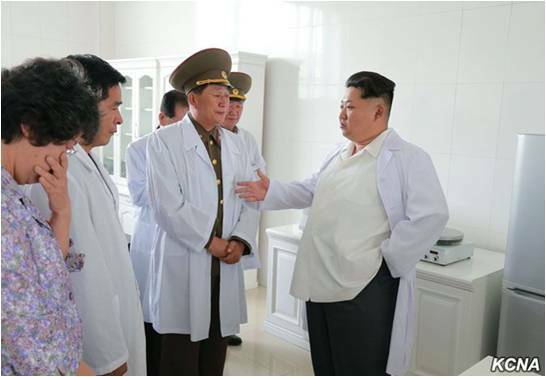 Kim Jong Un with scientists, staff, Unit 810, Hwang Pyong So, Ri Je Il and Jo Yong Won. 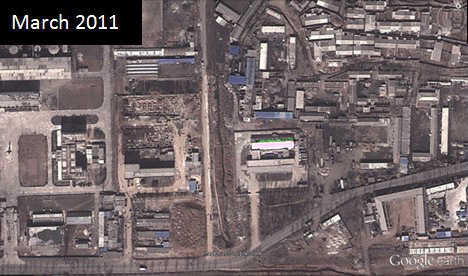 Images of Kim Jong Un touring the exterior of the facility make it possible to geo-locate the plant at 38.969200°/125.692787°, approximately 15 kilometers from the pilot facility established by CABI at the Plant Protection Institute. North-facing view of the Pyongyang Bio-technical Institute. Google Earth images of the site date back to June 2000 when it was comprised of two lots separated by an irrigation ditch. By 2001, a paved road had been built between the two lots but there were very few other changes until the winter of 2010-2011, when a large construction project joined and expanded the lots into a single facility over the course of a year. Construction at the Pyongyang Bio-technical Institute. 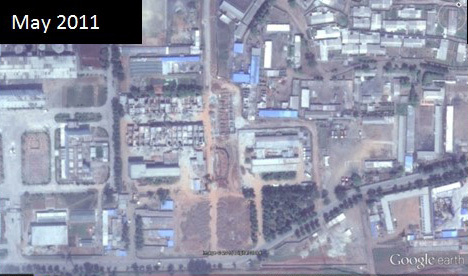 The May 2011 imagery shows the foundation of the new buildings, including the location of several multi-story tanks. Large external storage tanks were also added, as well as a powerful ventilation system. The resolution of the images is not good enough to identify the manufacturer of the ventilation system. Today, the ventilation fans and two above-ground tanks are visible, while one storage tank was buried. Installation of storage tanks and ventilation systems. The facility is located next to a coal-burning power plant providing the necessary electricity for production. 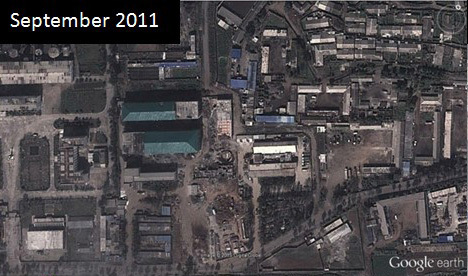 Between April and July 2014, the North Koreans installed an electrical substation that could have been intended to increase production and protect the batches from the disruption of a power outage. Moreover, there was surprisingly little security at the site. 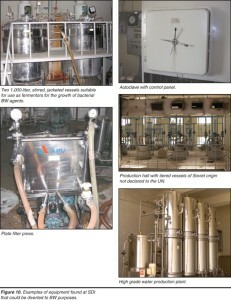 Images from the inside of the buildings at the Pyongyang Bio-technical Institute not only show that the facility can be used for large-scale production of anthrax, but also the presence of numerous chemicals and pieces of equipment that should not have been exported to North Korea. The first stage of production occurs in a laboratory. Agar is spread on small round plates and offers nutrition for bacteria like Bacillus thuringiensis or Bacillus anthracis to initially reproduce. Different reagents are introduced to test the bacteria. Later, the strongest strains of bacteria will be moved to progressively larger flasks with a nutritious broth for ongoing reproduction. This process is known as scale-up. Scientists will continually use a lab to test the quality of the bacteria to insure they develop a strain that will reproduce quickly and stand up to the industrial process. The flasks will be incubated and stirred to prevent the bacteria from settling on the bottom of the flask. This optimizes their reproduction. Eventually, the bacteria will be stressed to begin the production of spores, and will be separated from the broth to prepare it for drying into a powder. 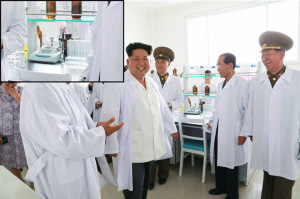 Kim Jong Un was seen inspecting bottles that probably contained nutrient agar and reagents. While the resolution of the images from the tour are not of sufficient quality to allow identification of the manufacturer or contents of the bottles, some of the labels bear markings resembling those used by the American companies Merck and Sigma-Aldrich. 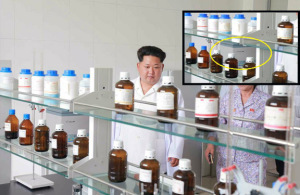 Transactions between American pharmaceutical companies and North Korea are, of course, prohibited, but these types of items are widely distributed across the globe by third parties. Therefore, if these bottles are from American firms, they were likely re-exported by another country, which may still flout export control laws. Some of the labels appear damaged or to be handmade. Bottles may contain agar and reagents. After growing an initial colony of bacteria, scientists continually check the quality in the lab. They will only choose a strain that is durable for the industrial process and high-yielding for fast production. Though not listed on the Australia Group’s control list, a colony counter (shown below) is an important part of an anthrax program used to accomplish this task. Scientists use a colony counter to count the bacterial colonies for selection of the highest quality and highest producing bacteria. The United Nations Monitoring, Verification and Inspection Commission (UNMOVIC) listed three colony counters in its inventory of Iraq’s BW program at Al Muthanna State Establishment. Scientists use smaller table-top incubators, like the Chinese-made PH-Series incubator (shown below), to control the temperature and humidity of the bacteria on small round plates for optimal reproduction. Once a colony outgrows the plates, it will be moved to progressively larger flasks. The orbital shaker (shown on cabinet below) stirs the contents of bacteria growing in flasks. The larger floor-standing incubator (shown below) houses the flasks. Larger flasks will also be placed in the floor-standing shaking incubator (shown below) to control the environment as the bacteria reproduces. For comparison, UNMOVIC documented five anaerobic incubators, and two shaking incubators, as well as an orbital shaker at the Al Muthanna State Establishment in Iraq. Once again, while this equipment can be used to produce biological weapons, the Australia Group does not control incubators. 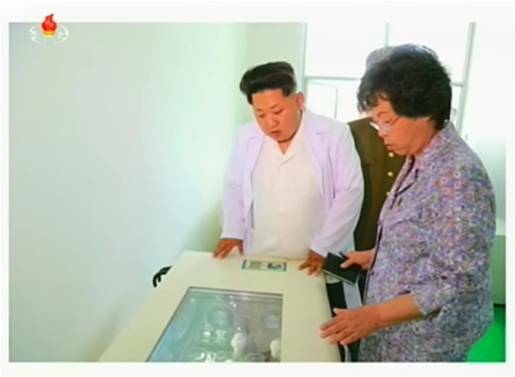 However, the PH-series incubator shown in the above Rodong Sinmun photo is made in China, which has “catch-all” controls that ban the sale of any technology if an exporter has reason to believe it would be used in WMD production. Eventually, scientists will separate the bacteria from the nutrient broth in the flasks. The North Koreans use a TDL-50B lab centrifuge (shown in yellow circle) made by the Shanghai Anting Scientific Instrument Factory. This size centrifuge is not listed on the Australia Group’s dual-use list, but larger versions with a flow-rate of 100 liters per hour are. While none of the published images show large industrial-sized centrifuges on the production floor, it may just be that they were not photographed or that the North Koreans may be using an alternative process to separate the cells. Scientists use ventilated hoods to handle materials that pose a biohazard. A Level-II hood, like the one in the picture below, offers partial containment by using negative pressure and high-efficiency particulate arrestance (HEPA) filters. Scientists handling Anthrax would typically use a Level-III safety cabinet that would offer complete containment. However North Korea could pair a level II cabinet with a one-piece positive pressure personnel suit. This is not an ideal working environment, but North Korea is not known for progressive labor practices. Strangely, the hood of the safety cabinet is not connected to a ventilation system, meaning it is not able to operate correctly. It is likely that this scene is staged for Kim Jong Un’s visit. A handle for an emergency shower can be seen in the hallway, and its reflection and that of another can be seen in the window. The Australia Group only controls Level-III safety cabinets and positively pressured suits with an external air supply. Once an optimal strain of bacteria is isolated and grown in the laboratory, it is time to scale up further on the production floor. Large fermenters are used to grow the bacteria, industrial-sized centrifuges (not seen) separate the spores from the media, and a spray dryer is used to formulate the spores into a powder. Sterile water is mandatory in order to prevent the introduction of foreign bacteria into the production line. 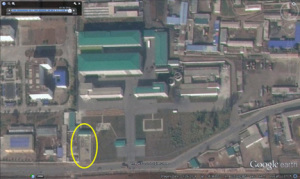 Like Iraq, North Korea houses its own reverse osmosis distillation equipment and stores the water on-site. A cylindrical autoclave for equipment sterilization is to the right of the distiller. Under the Australia Group, export of water sterilization equipment is not prohibited. Equipment in the production halls. The Pyongyang Bio-technical Institute has fermenters and bioreactors (pictured below), which are used to grow the bacteria while controlling oxygen levels. Batches are moved to progressively larger tanks. The fermenters shown below and in many other images of the tour are on the Australia Group’s dual-use control list because they can be used to produce bacteria like anthrax on a mass-scale. Therefore, their presence in North Korea could represent a violation of national export controls depending on the country of origin. The spray dryer (shown below) creates a vortex to dry the bacteria spores into a fine powder, which can then be sprayed as a fertilizer in the case of Bt or as a bioweapon in the case of anthrax. Spray dryers are also on the Australia Group control list. Iraq’s BW program also used spray dryers. Biological weapons facilities are notoriously difficult to identify and monitor because of their dual-use nature. What looks like a civilian facility can also function as a military facility. More challenging still, is the fact that these facilities can operate in each capacity as demonstrated by the Soviet and Iraqi BW programs. 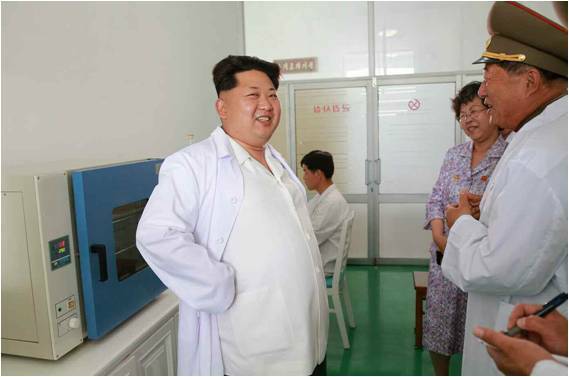 The Pyongyang Bio-technical Institute clearly fits that mode. Given North Korea’s known history and interest in biological weapons, it is hard to avoid the conclusion that the Institute is intended to produce military-size batches of anthrax. If Pyongyang was interested only in food security, it could have procured Bt bio-insecticide legally and at a fraction of the cost. Instead, by choosing to illicitly import the dual-use equipment, North Korea is likely using the facility to maintain a latent BW capability—or worse—actively producing anthrax. The bottom line is that regardless of whether the equipment is being used to produce anthrax today, it could in the near future. The author would like to thank Jeffrey Lewis for his support and input and Bo Kim for her Korean language research assistance. “N. Korean Biochemical Expert Flees to Finland: Source,” Yonhap News, July 2, 2015, http://english.yonhapnews.co.kr/business/2015/07/02/0501000000AEN20150702010200320.html. Anthrax is a disease caused by Bacillus anthracis bacteria. Because it has become common to refer to both the disease and the bacteria spores as “anthrax,” the author uses the term both ways. “United Nations Monitoring, Verification and Inspection Commission (UNMOVIC), Compendium: The Biological Weapons Program,” United Nations, June 21, 2006, http://www.un.org/Depts/unmovic/new/documents/compendium/Chapter_V.pdf. Sonia Ben Ouagrham and Kathleen M. Vogel, “Conversion at Stepnogorsk: What the Future Holds for Former Bioweapons Facilities,” Cornell University Peace Studies Program Occasional Paper 28 (2003), accessed July 8, 2015, http://www.isn.ethz.ch/Digital-Library/Publications/Detail/?ots783=cab359a3-9328-19cc-a1d2-8023e646b22c&ots591=cab359a3-9328-19cc-a1d2-8023e646b22c&lng=en&id=16950. “Park Geun Hye Group Accused of Conniving at U.S. Introduction of Anthrax Germs,” KCNA, June 2, 2015, http://www.kcna.co.jp/item/2015/201506/news02/20150602-24ee.html; “U.S. and S. Korean Authorities’ Moves for Biochemical War Denounced,” KCNA, June 2, 2015, http://www.kcna.co.jp/item/2015/201506/news02/20150602-08ee.html. “North Korea Accuses U.S. of Targeting it with Anthrax,” Reuters, June 12, 2015, http://www.reuters.com/article/2015/06/12/us-usa-northkorea-un-Anthrax-idUSKBN0OS1N820150612. Centers for Disease Control and Prevention, “Anthrax Treatment,” accessed July 8, 2015, http://www.cdc.gov/anthrax/medicalcare/treatment/index.html. “North Korea’s Chemical and Biological Weapons Programs,” International Crisis Group Asia Report 167 (2009), http://www.crisisgroup.org/~/media/Files/asia/north-east-asia/north-korea/167_north_koreas_chemical_and_biological_weapons_programs.pdf. Jim Garamone, “Commander Assesses North Korea’s Conventional Threat,” American Forces Press Service, August 26, 2005, accessed July 8, 2015, http://www.defense.gov/news/newsarticle.aspx?id=16791. More images and video of CABI’s projects in the DPRK can be found at: https://www.flickr.com/photos/[email protected]/albums and https://www.youtube.com/watch?v=xe83BvT01Go. Jing-dong Yuan, Phillip C. Saunders, and Stephanie Lieggi, “Recent Developments in China’s Export Controls: New Regulations and Challenges,” The Nonproliferation Review, Fall-Winter 2002, http://cns.miis.edu/npr/pdfs/93yuan.pdf. “Bt-based IPM Boosts Cabbage Production in North Korea,” Pesticides News 88 (2010), http://www.pan-uk.org/pestnews/Issue/pn88/PN88_p8-11.pdf; See also this paper co-authored by CABI and DPRK PPI staff: Manfred Grossrieder, Beate Kiefer, Song Il Kang, and Ulrich Kuhlmann, “Case Study: Knowledge Transfer in Cabbage IPM Through Farmer Participatory Training in DPR Korea,” Second International Symposium on Biological Control of Arthropods, http://www.bugwood.org/arthropod2005/vol1/6d.pdf. 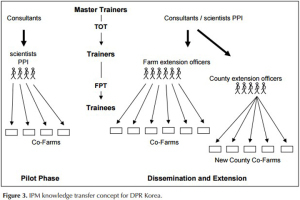 Manfred Grossrieder et al., “Case Study: Knowledge Transfer in Cabbage IPM Through Farmer Participatory Training in DPR Korea,” Second International Symposium on Biological Control of Arthropods, http://www.bugwood.org/arthropod2005/vol1/6d.pdf. Due to the quick turn-around time of this article, CABI did not have time to respond to the author’s questions. Sonia Ben Ouagrham and Kathleen M. Vogel, “Conversion at Stepnogorsk: What the Future Holds for Former Bioweapons Facilities,” Cornell University Peace Studies Occasional Paper #28, February 2003.